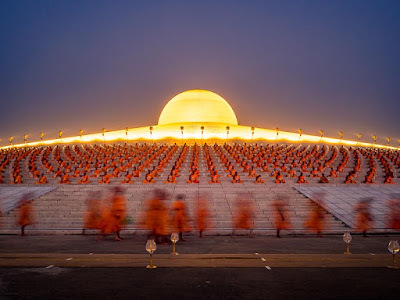 Buddhist monks walk to their places for the observance of Makha Bucha Day at Wat Phra Dhammakaya in Pathum Thani. Holy days in Buddhism are based on a lunar calender and the dates change year to year. Makha Bucha Day, also called Magha Puja, Sangha Day or Fourfold Assembly Day, is celebrated on the full moon night of the third lunar month. It marks the occasion when 1,250 monks, enlightened ones ordained by the historical Buddha, spontaneously sought him out to hear him speak. It's one of the most important holy days in Theravada Buddhism and is celebrated by merit making, meditation and candle light processions at most Theravada Buddhist temples in Asia. It's a public holiday in most of Southeast Asia and celebrated in Thai, Lao and Cambodian communities in the US. 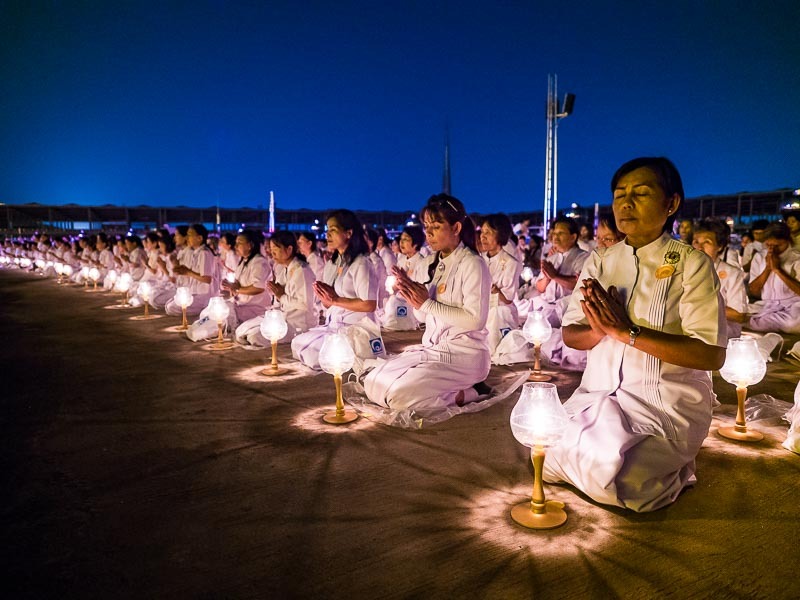 People gather in prayer at Wat Phra Dhammakaya. This year I went out to Wat Phra Dhammakaya in Pathum Thani province, about 90 minutes from our Bangkok apartment. 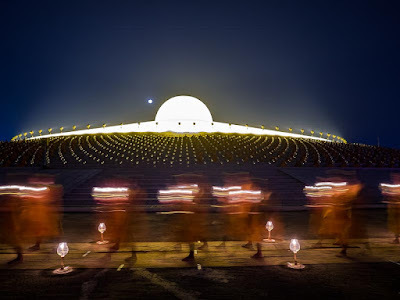 Wat Phra Dhammakaya is the headquarters of the Dhammakaya sect, a relatively new sect of Thai Buddhism. Monks sit on the sides of the chedi before the service at Wat Phra Dhammakaya. 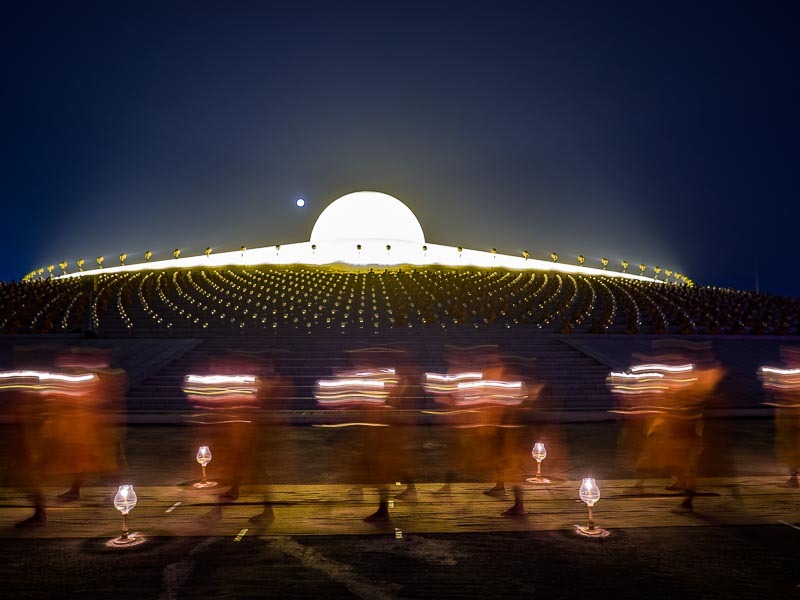 Wat Phra Dhammakaya is famous because it is unlike any other Buddhist temple in Thailand. Flights landing at Don Mueang airport pass directly over the temple and to the uninitiated it looks more like a UFO sitting on a landing pad than it does a Buddhist temple. The UFO comparison is even stronger at night, when the temple is lit up and the chedi's golden glow fills the night sky. Dhammakaya is not without its critics, in Thailand and abroad. 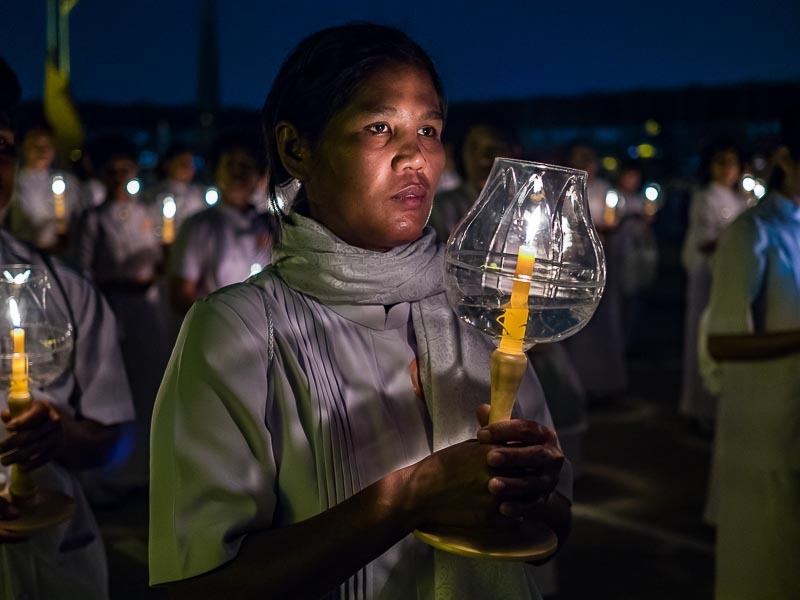 Members of the Dhammakaya actively evangelize and seek out converts to Buddhism. Theravada Buddhists in most of Southeast Asia are open to non Buddhists coming to their temples and asking about Buddhism and they're happy to spend as much, or little, time as you want with them while they discuss Buddhism and their beliefs. But Dhammakaya actively recruits. And they preach sort of a Thai version of the prosperity theology, a Buddhist version if you will, of what some evangelical Christian sects in the US preach. At the start of the candle light procession around the chedi, people line up with candles and lanterns. 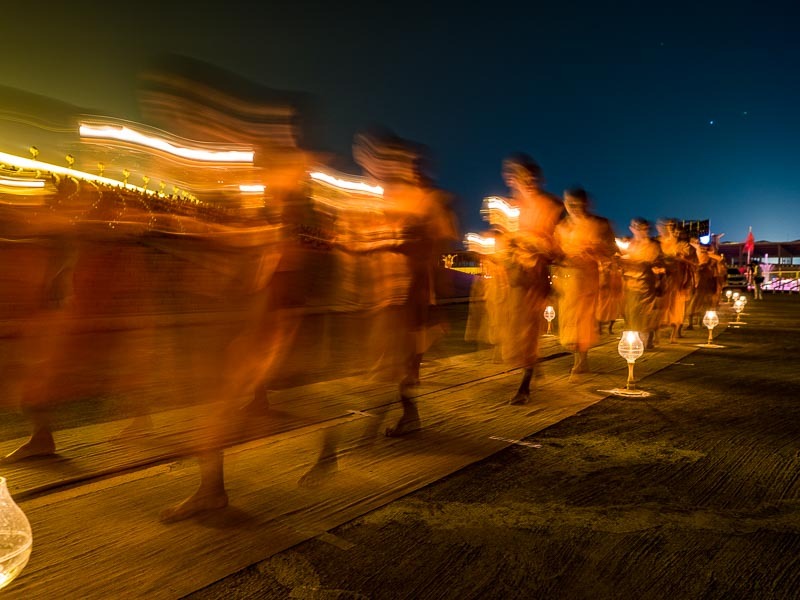 Monks walk around the chedi during the candle light procession. This is very different from what is taught in traditional Theravada Buddhism, which teaches that you make merit through deeds and actions on your path to enlightenment and that through reincarnation you come back a higher being. 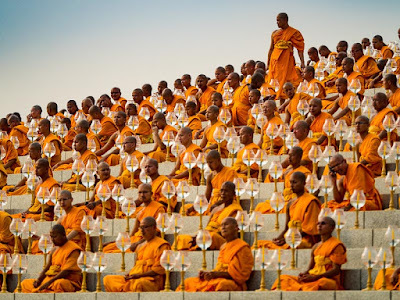 The Dhammakaya movement has a lot of adherents in Thailand and temples throughout the Europe and the US. 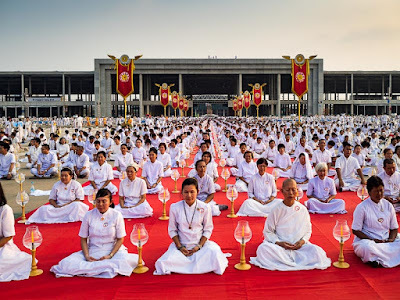 Dhammakaya sponsors high profile events, like the annual mass pilgrimage of monks through central Thailand and large merit making ceremonies in Bangkok. 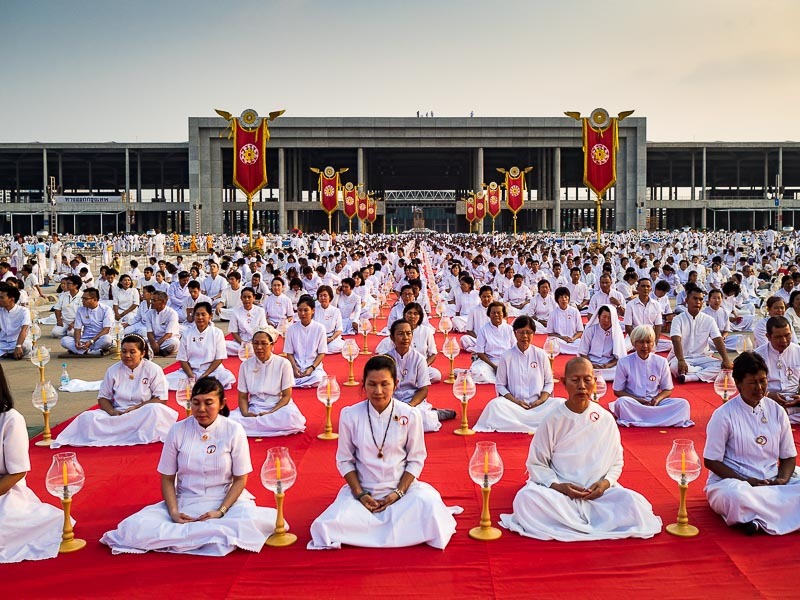 Dhammakaya has been involved in efforts to make Buddhism the state religion in Thailand, a move that so far has not been successful. People gather on the plaza in front of the chedi at Wat Phra Dhammakaya. 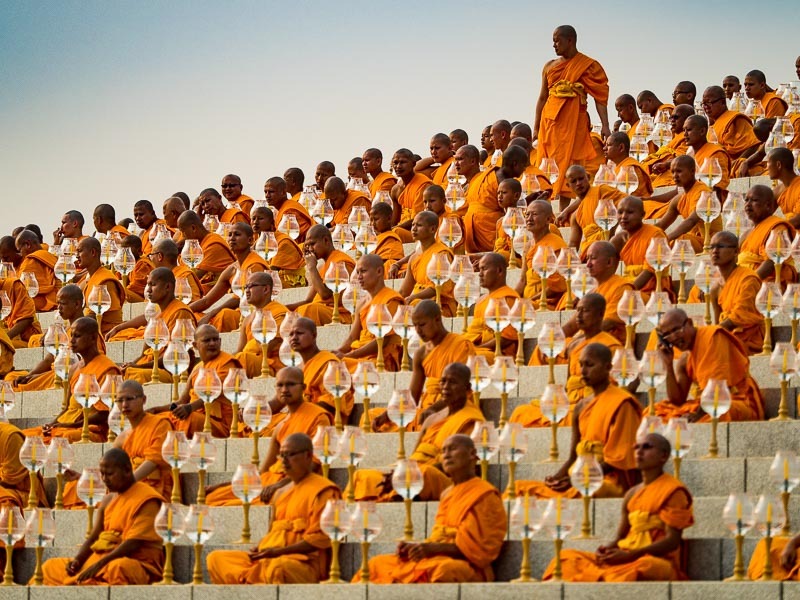 Tens of thousands of lay people and thousands of monks attend the Makha Bucha ceremonies at the temple. Although Thailand is 85 to 90 percent Buddhist, and Islam is the second largest religion, there is no state religion in Thailand. Dhammakaya would like to change that, in much the same way the American religious right wants to make Christianity the state religion in the United States. The monks' candle light procession around the chedi. The full moon can be seen to the left of the dome of the chedi. 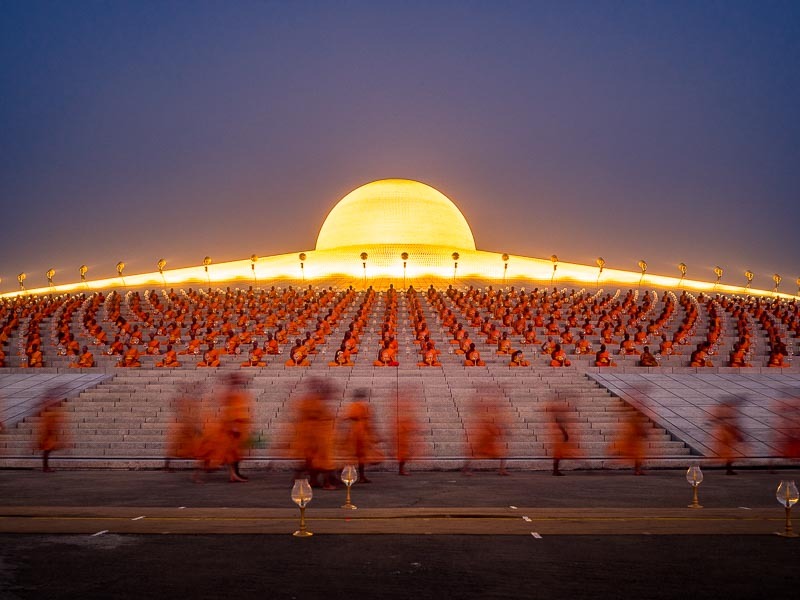 There are more photos of Makha Bucha in my archive or available from ZUMA Press.